In my previous posts, Mamma Mia, What Do You Eat? and Vegan in Italy, Part II, you came along with me on my vegan travels from Positano to Naples to Rome – and I’m so glad you did! Today, we’re taking the last leg of our journey through the regions of Umbria and Tuscany, where we’ll end our trip in fabulous Florence. Andiamo! Let’s go and see what we can eat! On our way from Rome to Perugia, we stopped in Orvieto, a quaint hilltop town with the amazing ability to transport you back in time. The winding streets are stone, the old houses are confidently crooked and cracked, and the duomo (cathedral) looms large, ominous, and beautiful in the square. All of this sits dramatically above the rest of the landscape on top of a steep hill. It feels like you’ve been dropped straight into the Middle Ages. You have to visit to feel this magic for yourself. Roasted potatoes and various verdure (vegetables). Those roasted potatoes – I don’t know how they made them so delicious. They were just simple, roasted potatoes with olive oil, garlic, and herbs, but somehow (because they were made in Italy?) they were so much yummier than when I make them at home! Not only is it upsetting that it’s a dead animal part hanging on a wall – it grosses me out! 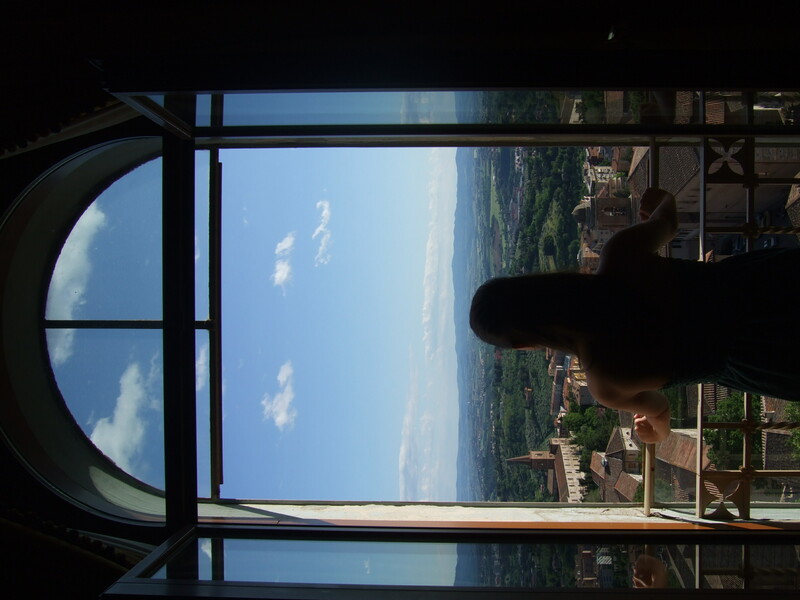 After I took a few deep breaths and ate my gelato, we strolled over to the bell tower to climb it for an even better view of the surrounding countryside. 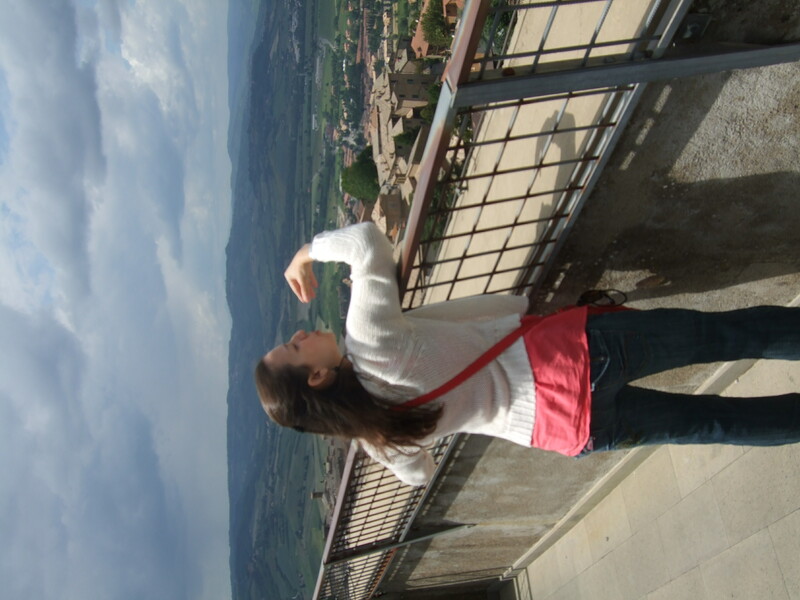 There, I was able to blow kisses to all of Italy and its food, art, and people. 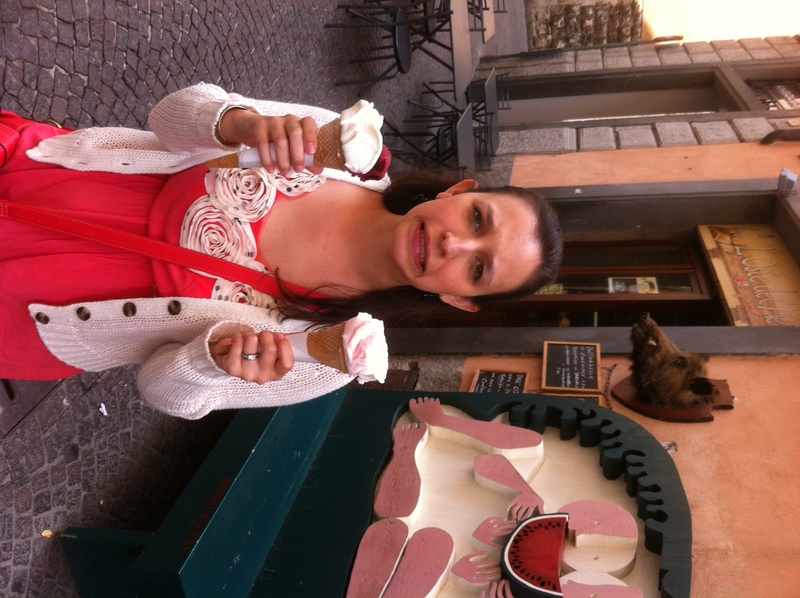 This was a “We’re in ITALY” moment. Pretty Perugia was our next stop. This place had some chic shopping streets (I scored my now-favorite emerald green skirt there!) 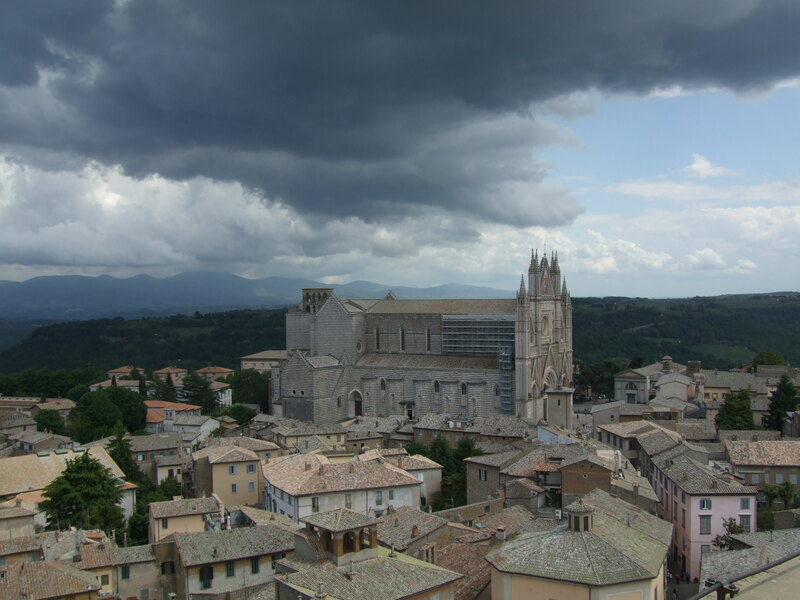 and breathtaking views of surrounding Umbria. 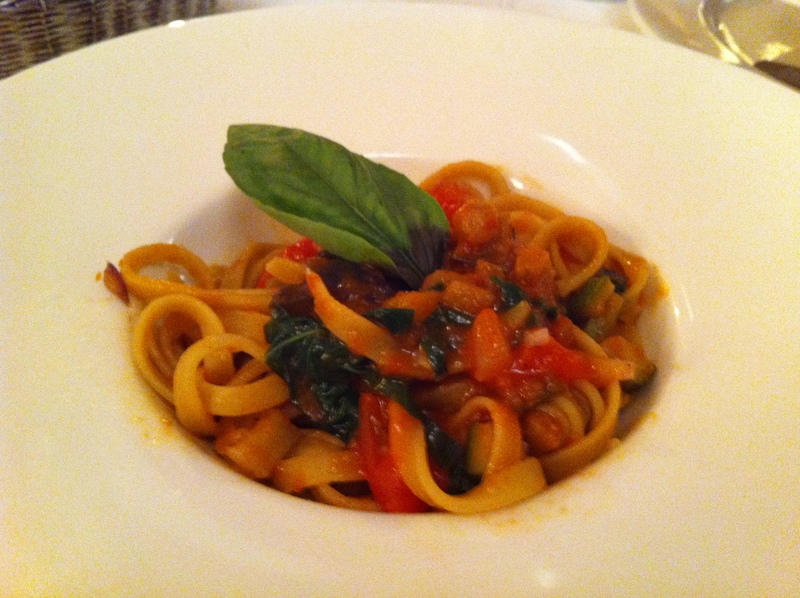 That night, an elegant dinner awaited us at La Trattoria. The chef came out to greet us and highly recommended the leg of lamb. 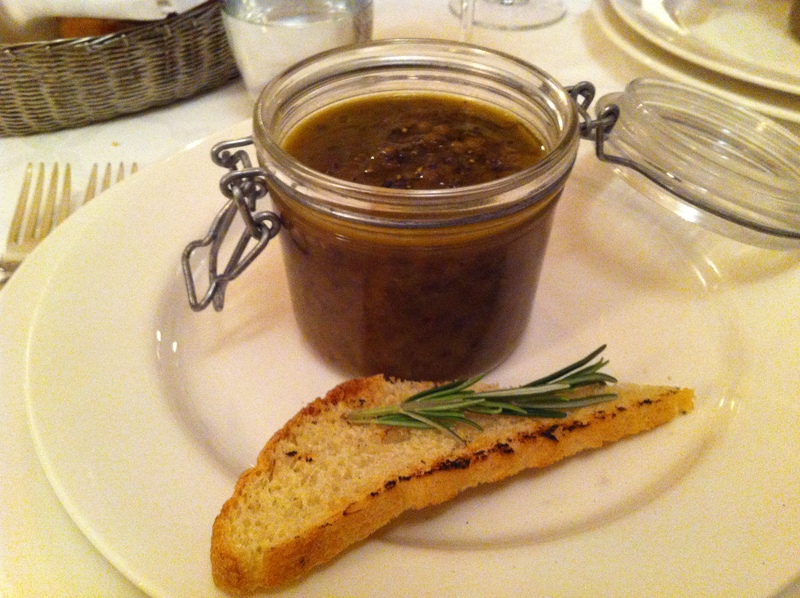 We got started with this hearty, deeply herbed lentil soup (in a super cute little container!). 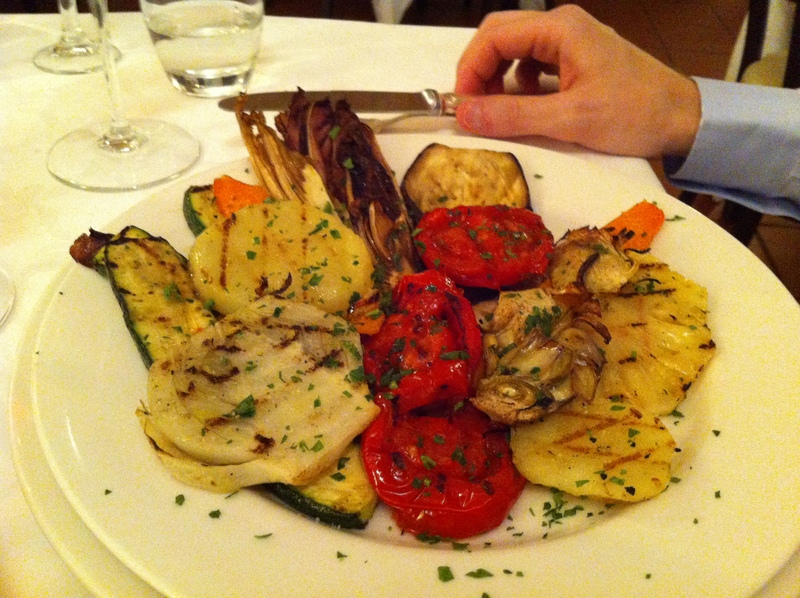 For our main course, we once again delighted in Italy’s fresh bounty of vegetables, grilled to perfection. And for our third course, a lovely pasta with tangy, basil-y sauce. I kind of wanted to reenact the spaghetti scene from Lady and the Tramp but was able to resist. The next day, we took the short trip to Assisi, home of St. Francis, beloved patron saint of animals. I loved getting to tour his Basilica and see the many murals of him interacting with birds and other creatures. 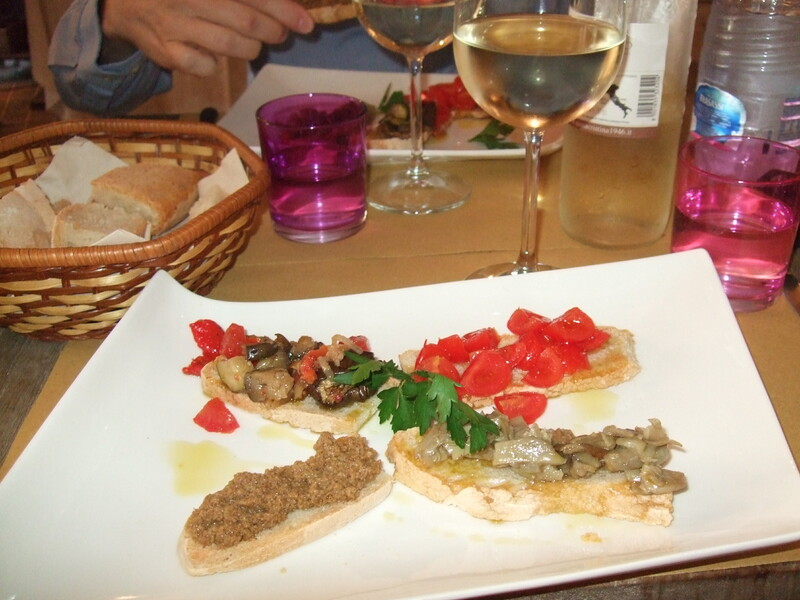 We also had a wine tasting and lunch at the osteria of a winery in Torgiano (but forgot to take pics – FAIL!) before heading back to Perugia for the night. 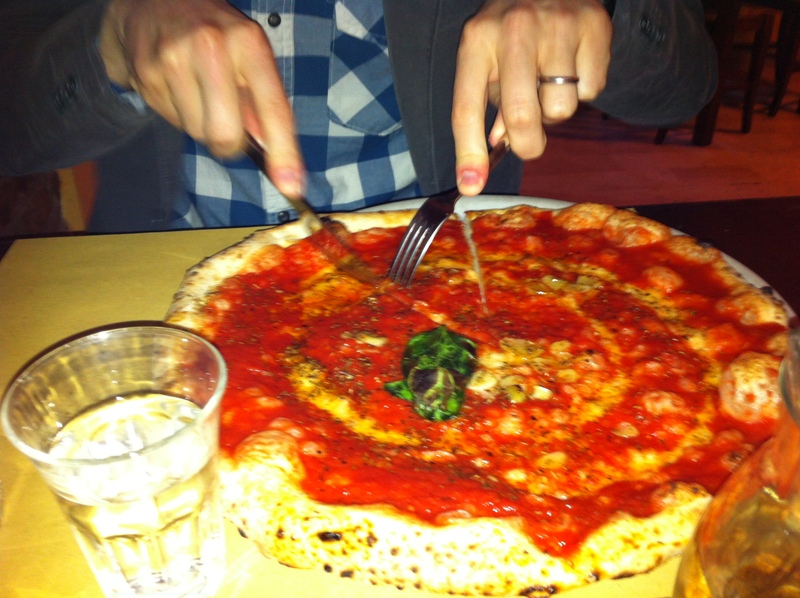 This time, we ate so-fresh-it’ll-blow-your-mind pizza at a hole in the wall restaurant called Meditteraneo. 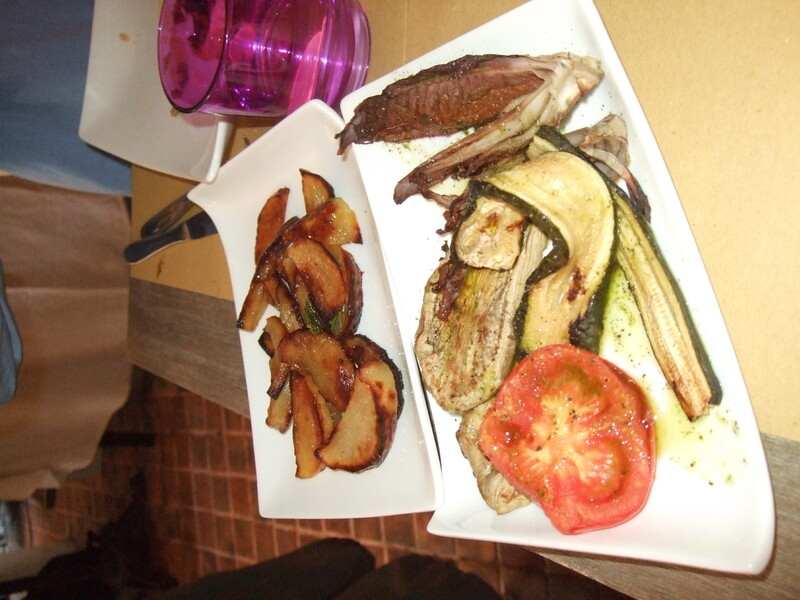 We did note the further North we traveled in Italy, the more meat showed up on the menu. And not American meat that we’re used to seeing. Boar. And pigeon. Despite this, it was still easy to order vegan at every restaurant by speaking with the server and/or by choosing the vegetarian dish and asking for no cheese. From Perugia the next day, it was off to Siena with its famous black and white duomo for a short tour, and then…to Florence. I could have spent weeks in the famous art museums the Uffizi Gallery and the Galleria dell’Accademia just staring at the overload of beauty all around us. There was plenty of outdoor beauty to be breathed in too though, so we walked all around (it’s such a walkable city) to see the sites. 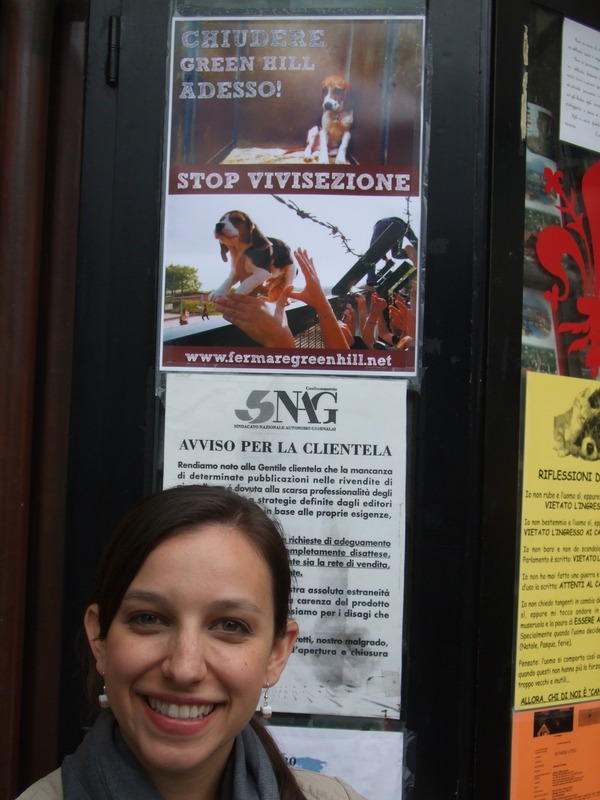 On our way to the Piazzale Michelangelo, we passed a poster for an anti-animal-testing group. It’s so awesome to see animal activism around the globe! There are compassionate people everywhere. And then it was time for gelato and lunch (in that order). Our next-to-last gelato in Italy. The next day, it was more site-seeing and time to explore the vegan/vegetarian restaurants we had scoped out on HappyCow.net. 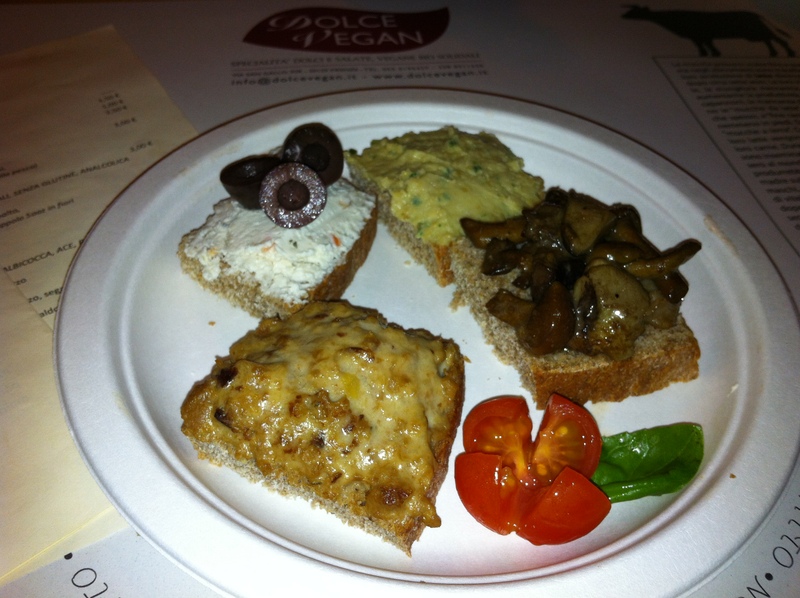 There were several to choose from, but we headed to La Dolce Vegan based on their great reviews. We were a bit giddy at the huge list of things we could order on their all-vegan menu, so we went a little nuts. As in three pieces of tiramisu nuts. Over the course of a few hours though…that makes it ok, right? A selection of bruschetta for antipasti. The one in the foreground was incredible with little bits of tempeh in a savory, cheesy mix. 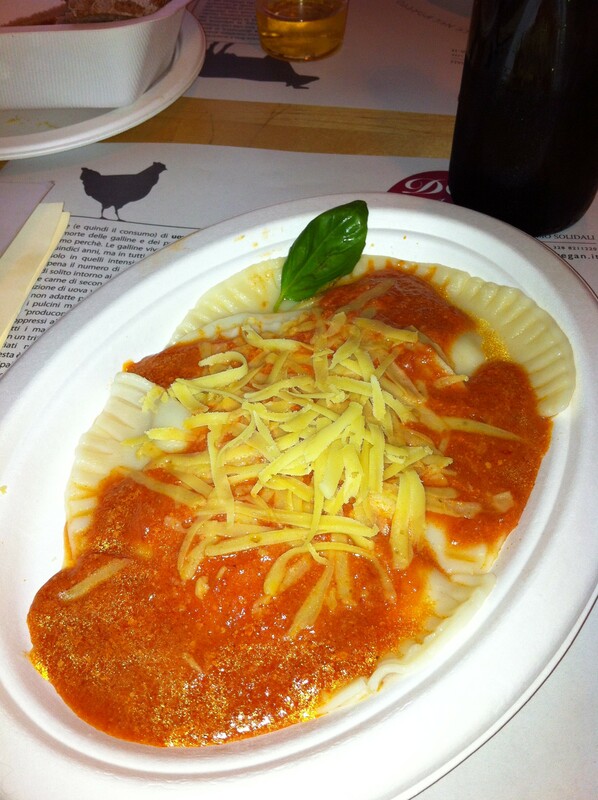 This ravioli was incredibly indulgent with a smooth, creamy filling, cheesy meltiness on top, and intensely fresh red sauce. 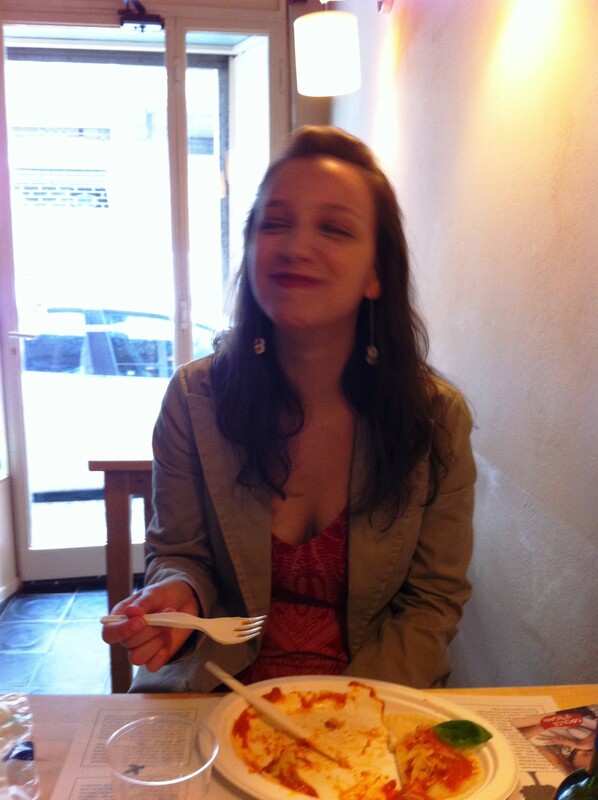 Here I am going crazy over the ravioli. 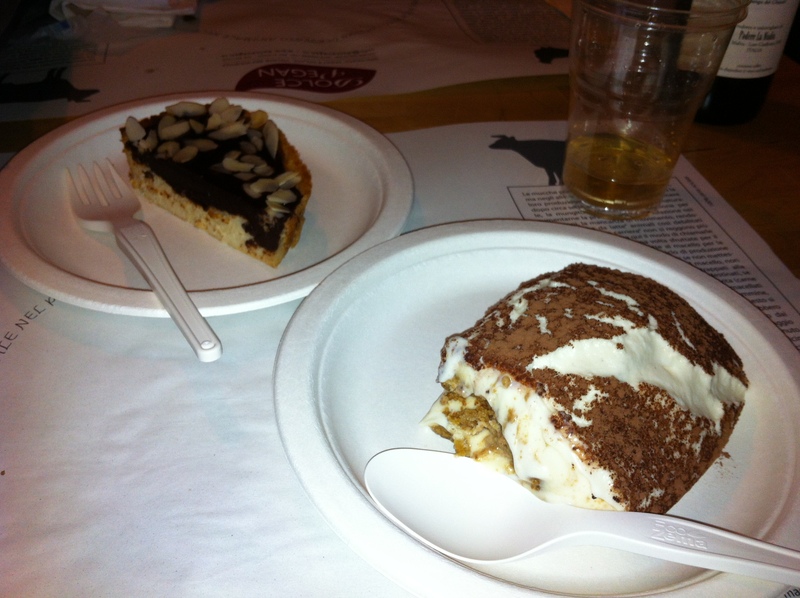 Chocolate cheesecake and Tiramisu from Dolce Vegan in Florence. We had three pieces of tiramisu from there by the time that day was over. After going back to La Dolce Vegan for dinner, doing some shopping, and climbing to the top of the duomo early the next morning, it was time to head back to the States. 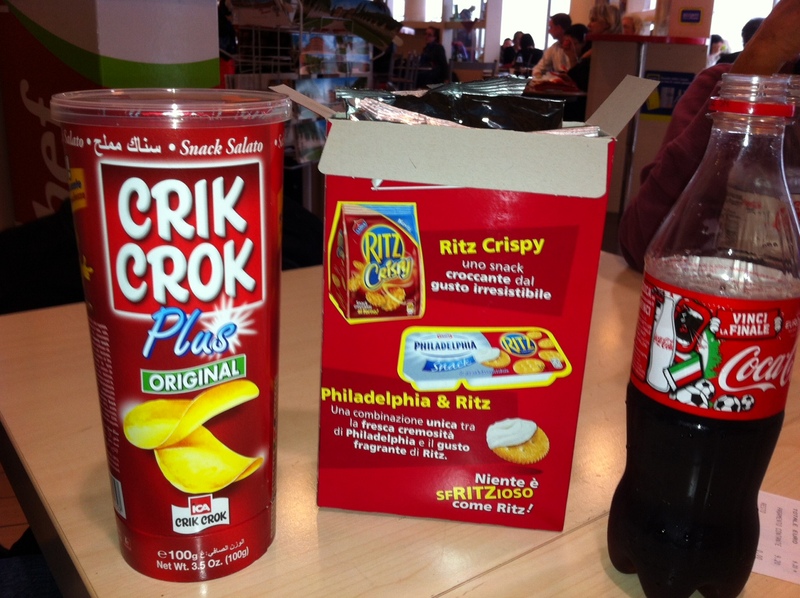 Here’s the snack we grabbed in the airport on our way back. Arrivederci, Italia! Ciao, ciao, ciao! Kisses on both cheeks! I love you and your food and your people and your history and your art and your culture! I will be back for more! To Compassion All Over the World! 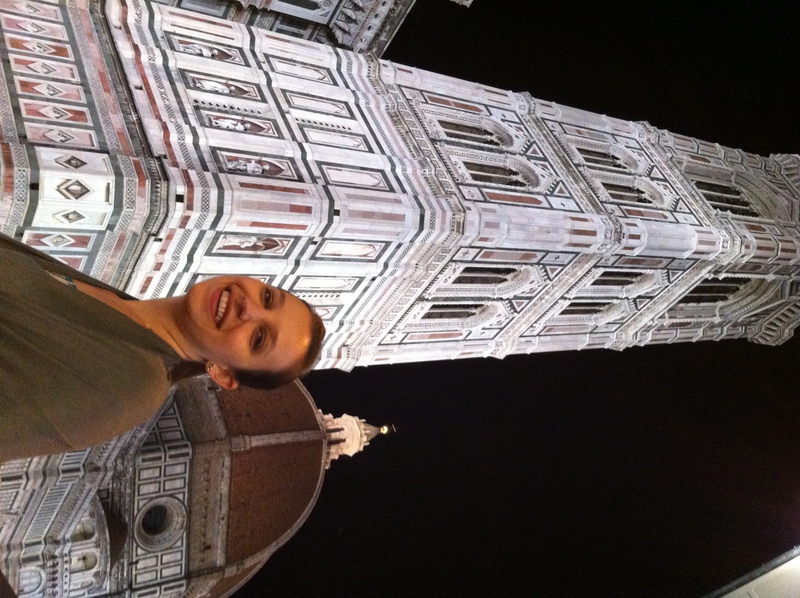 florencia wonderful place, wonderful food. Yes, Florence is so fabulous! Thanks for sharing your love of the city and its food with me! We’re planning a trip to Italy for my birthday late next year (and it just dawned on me that I’ll be turning 30… mini-panic-attack officially induced). What are the select phrases you mastered before your trip? Happy early 30th! 🙂 A trip to Italy to celebrate is perfect!! Phrases I used frequently were “I am vegan:” Io sono vegana; “I don’t eat meat:” Io non mangio carne; “No dairy?” senza latticini? ; “Without cheese” senza formaggio; “No eggs?” senza uova? I found these very helpful! Traveling around Italy as a vegan with these few phrases was a snap! Do you know if the cones w/ the gelato were usually vegan? I think I got mine in a cup when I went a while back cause I wasn’t sure. Thanks for relaying your experience, I can’t wait to go back! Hi there! Good question – some were and some weren’t; I always asked. 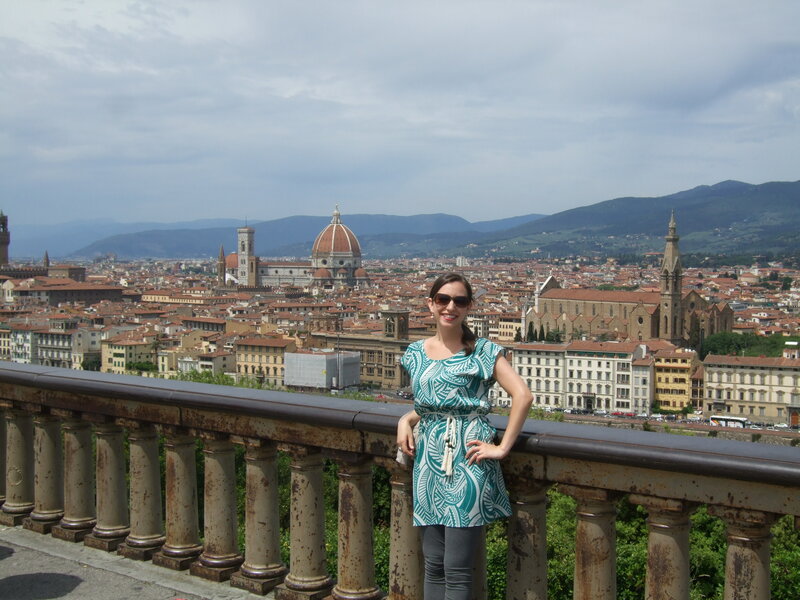 And yes, Italy makes it so anyone who visits can’t wait to return! 🙂 Have a great trip when you go again! So after my last trip a couple months ago I confirmed that Blue Ice (in Rome) uses cones that aren’t vegan (contain milk/egg-derivatives), FYI. Man I can’t wait to go back though! Grazie mille! 🙂 Mi è piaciuto molto visitare il vostro Paese. Un abbraccio da South Carolina! 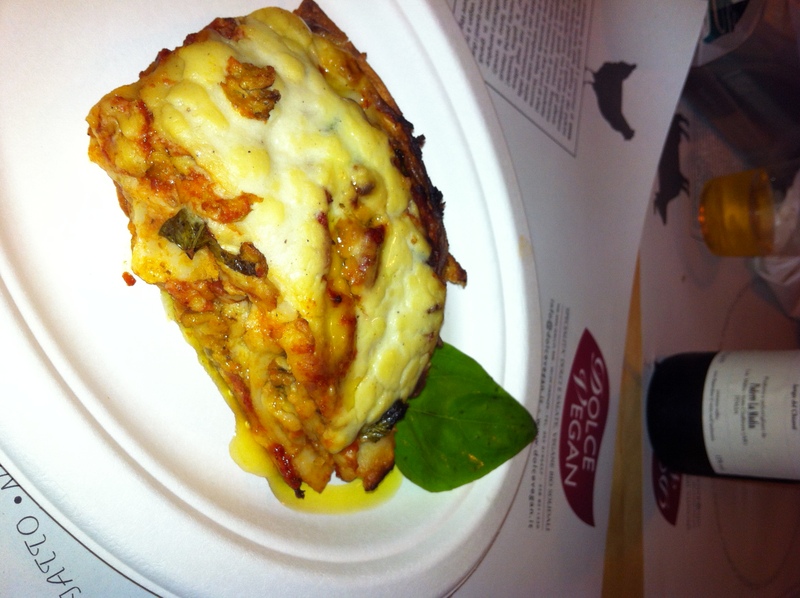 Thanks for your great tips for eating vegan in Italy. 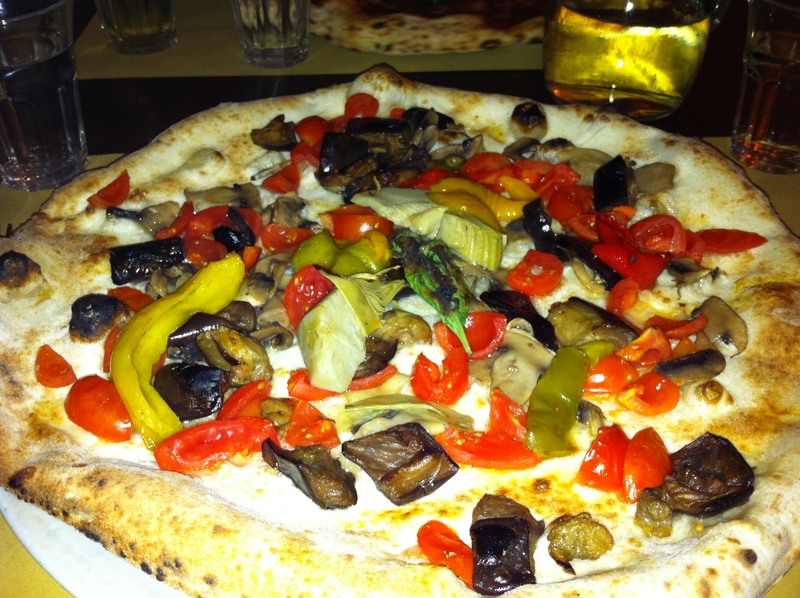 Fortunately, more and more vegan options are appearing in Italy. If you come to Syracuse, Sicily, there is an incredible completely vegan restaurant that just opened last year in Ortigia called MOON: MOVE ORTIGIA OUT OF NORMALITY. I had the incredible opportunity to enjoy the wonderful food and atmosphere of MOON on a trip to share TriYoga in Ortigia and now I am enjoying a two month residency at MOON. As an ethical vegan, it is difficult for me to find restaurants where I feel comfortable eating and who cater to customer satisfaction. MOON is not only a fully, vegan restaurant, but offers whole-grain, organic, gluten-free and raw-vegan options, and the most incredible chocolate desserts I have ever eaten. The vegan chef, Enza is very accommodating if you have special requests. MOON is not only a unique, beautiful restaurant and bar, but a cultural center that hosts all varieties of artists, musicians and practitioners of holistic arts for people of all ages and for the welfare and benefit of All Sentient Beings. MOON also opportunities to travelers on a budget to work 5 hours a day 5 days a week in exchange for a room in a beautiful, shared apartment and meals at MOON.